To use Online Bill Pay, log in to your account. Welcome to the Online Bill Pay Get Started Guide. A helpful resource for true control and total convenience. To access your account, log in and enter the User ID and PIN you created during the enrollment process. The first step to making a payment is to add a payee. 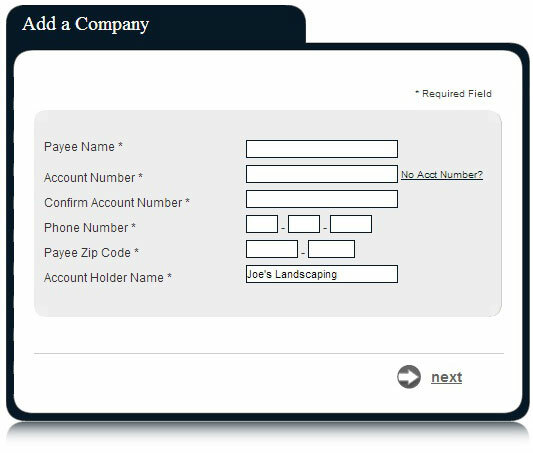 To add a company, you will be required to input information that can be found on your most recent bill. Allow the individual to provide his/her banking information. Share the keyword with the individual you wish to pay. The individual will receive an email with a secure site link. 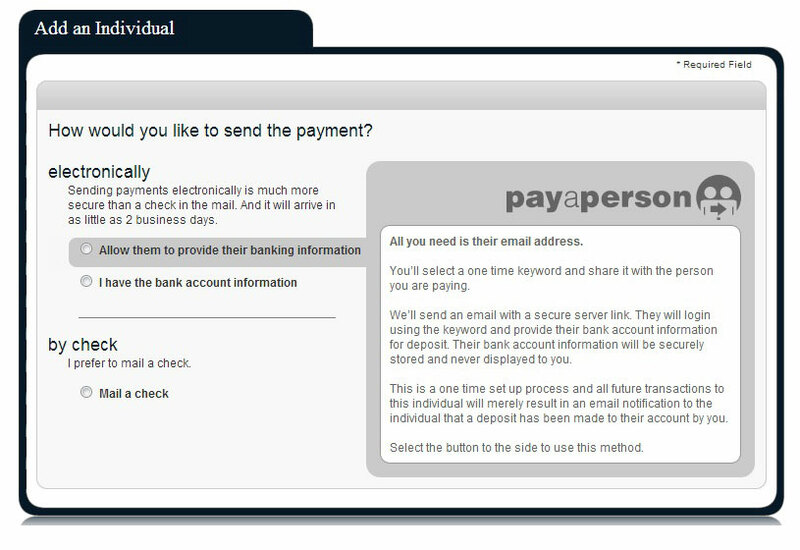 Using the keyword you provide, the individual can log in and provide his/her bank account information. That bank account information will be securely stored and never displayed to you. This is a one-time setup process. All future transactions to this individual will merely result in an email notification to the individual that you have made a deposit to the specified account. Enter the individual's bank account information. To complete the setup process, you will need to enter a one-time activation code. The code will be sent to you immediately via the delivery method of your choice: phone, text message or email. With this option, you will need to provide the individual's full name and complete mailing address. First, choose the account type. Enter the requested account information, review and submit. Now you can schedule a payment to your payee. Before you can make a payment, you must first add the person or company you wish to pay. To learn more, visit the “How to set up a payee” section. Once you've added a payee, go to the “Payments” tab. You can choose to make a “Single Payment.” This is a one-time payment. You can choose to make a “Recurring Payment.” This is a consistent payment that recurs on a regular basis, such as an insurance payment or an office lease. 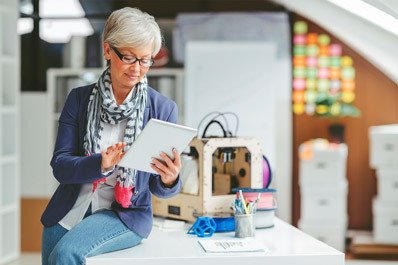 Once you select the type of payment, choose a payee from your Payee List, or add a new payee. For recurring payments, you can also select the payment frequency and the series end date. From there, you will see your Admin User List. This allows you to view the current permission settings for this user and to edit these settings. Allow the user to schedule payments to any payee or to specific payees that you choose. 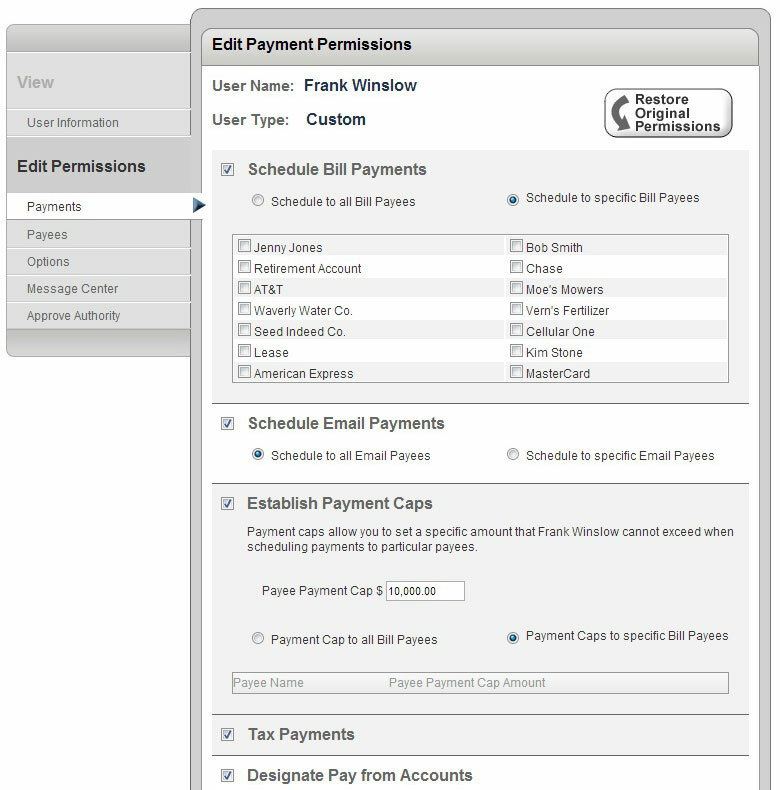 Allow the user to schedule payments to all email payees or to specific email payees that you choose. 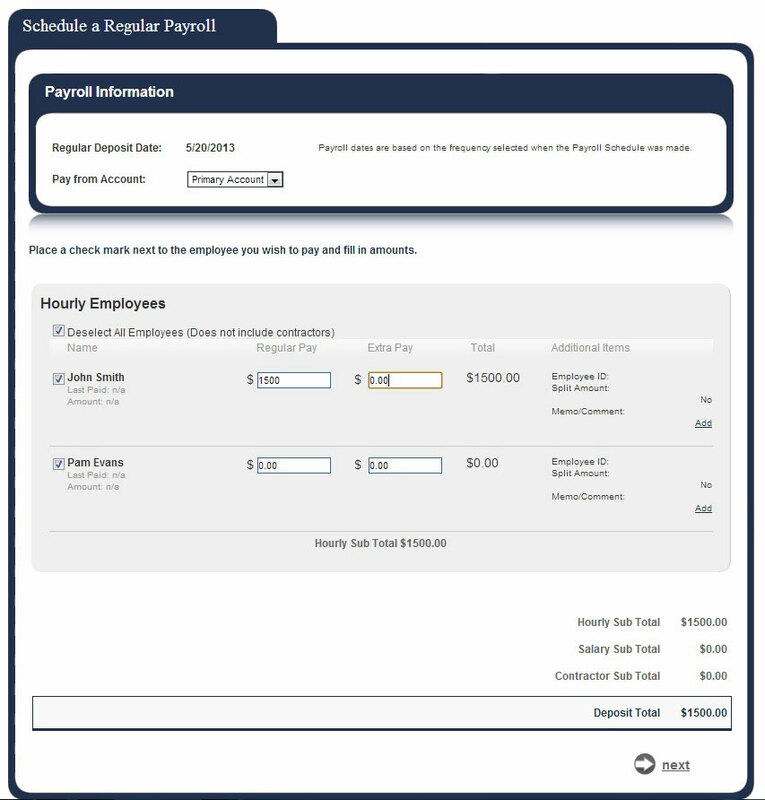 Set specific payment caps for each payee, or set a payment cap that applies to all payees. The user will not be able to exceed this cap when scheduling payments. 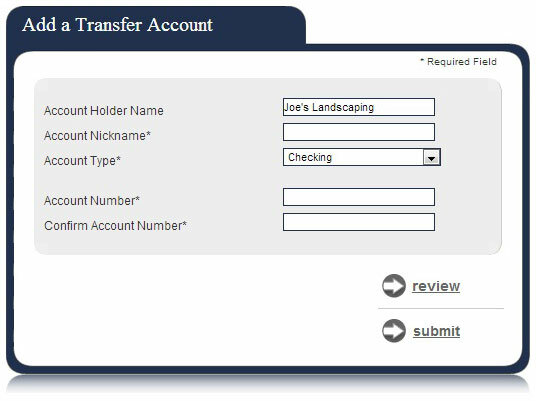 Determine which accounts the user can make payments from. 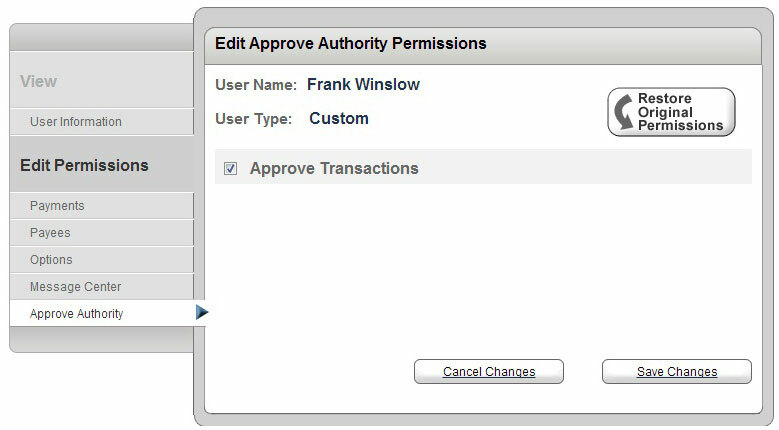 Select “Approve Authority” in the Edit Permissions menu to indicate that you want to approve transactions. Go to the “Transfers” tab. Select the type of transfer you want to make: a single, one-time transfer or a recurring transfer. Next you will need to set up your transfer accounts. 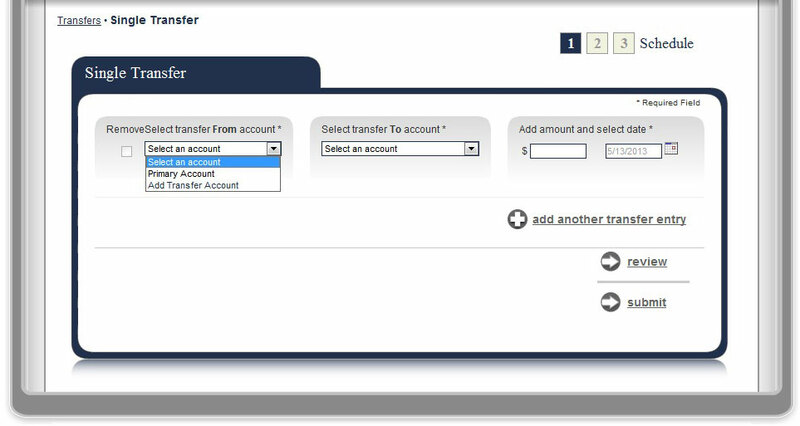 You can choose to add a transfer account from our institution or another institution. Enter the account name, type and number to add the new account. Go to the “Payments” tab. 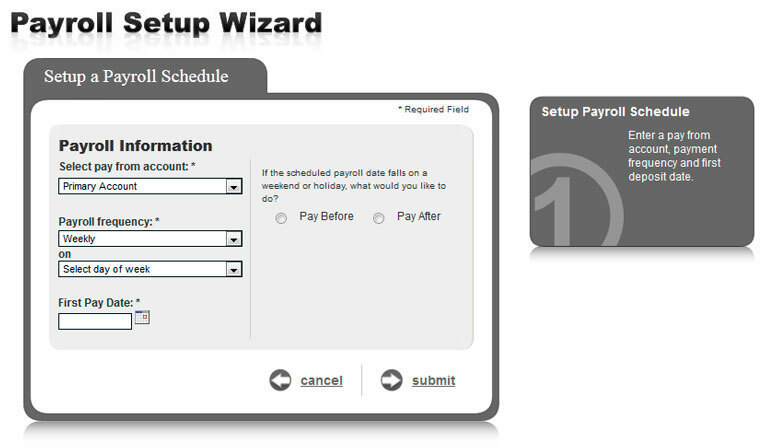 If this is your first payroll deposit, the “Payroll Setup Wizard” will walk you through a simple, three-step process. Step 1: Set up the payroll schedule. Step 3: Schedule a deposit. 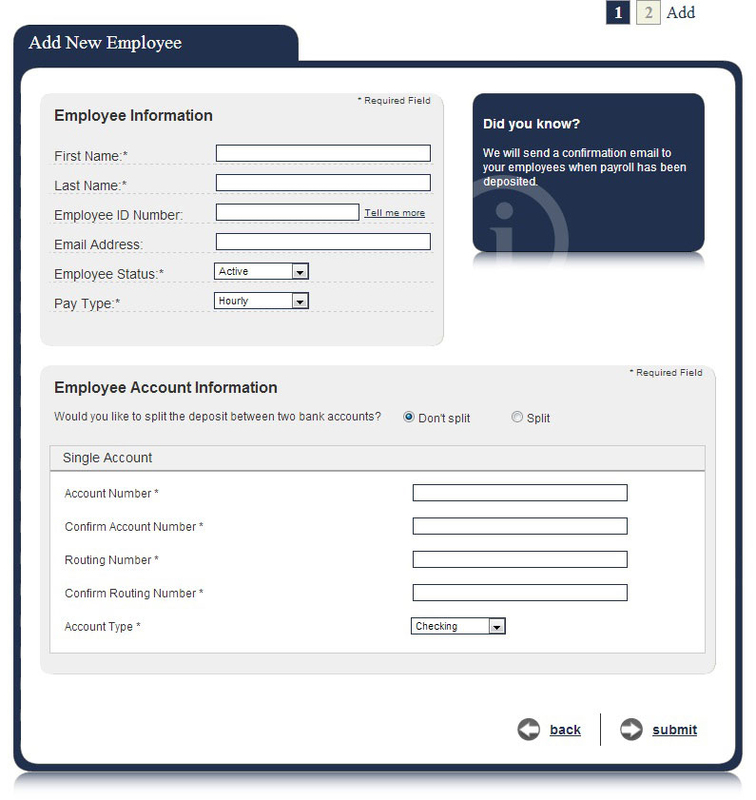 Once you complete the setup, you will be taken to the Payroll Deposits page. Before setting up eBill, you must first add a payee. To learn more, visit the “How to set up a payee” section. Once your payee is set up, you can select "set up eBill" on your bill pay dashboard. Now you'll see that an “eBill sign up" window appears. You'll need to enter your login credentials for the payee's website. Once you do, click “Accept and Submit.” The eBill setup process will identify your account using the credentials you provided. Then you will be asked to “Confirm your eBill account.” You will see the biller name, account name and your account number. 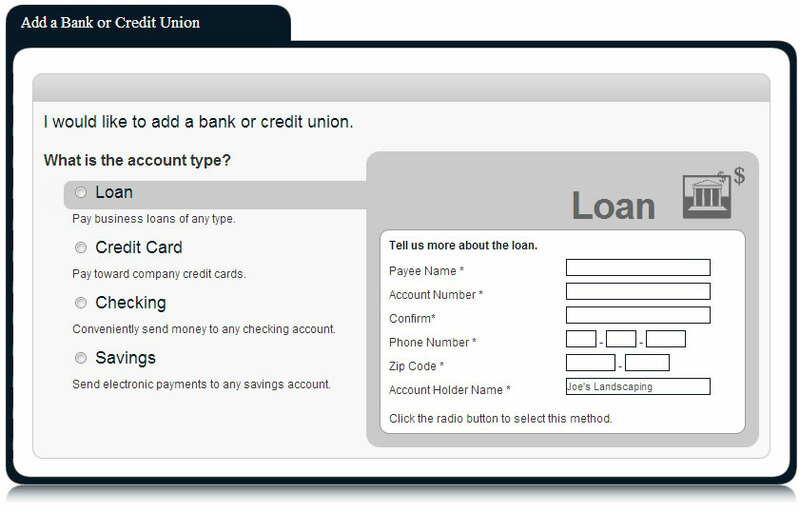 Once you've validated your account is correct, click the "Complete Setup" button, and your eBill is added. You will then receive a confirmation email. You will also continue to receive paper statements from your payee unless you contact your payee to stop sending those statements. When your eBill payee has been added and confirmed, you can simply select the “Pay” link under the payee's listing to schedule a payment. You're not just another customer. We're not just another bank.